We’ve taken Igniter – our new vehicle sound design VST/AU/AAX plugin – for a test-run to demonstrate how Igniter’s built-in presets can easily be used to create a variety of complex vehicle sound effects. In this tutorial, Andrew details each processing stage of creating the sound effects for our recent promo videos. We’ve used a variety of vehicle scenes that sound designers commonly find themselves working with: featuring car engines, futuristic vehicles, and helicopters. Learn about the process and find out how quick and easy it was to modulate and add parameters from Igniter’s built-in presets in the tutorial. The first promo video features footage of a sci-fi car with a futuristic feel, which sees the vehicle panning slowly across the screen. To bring this particular scene’s electric ambience and movement to life, we layered both a synth and loop presets, both available in Igniter’s factory presets. The parameters of the presets were adapted and blended to tweak the tone of the car. By attaching automation in the DAW, we’re able to let the sound effects rise in time with the car on screen. Next, we’re faced with the challenge of working with helicopter footage, showing a helicopter rising up and moving away into the distance. Here we chose Igniter’s inbuilt ‘Huey Overhead Movement’ preset, and hybridising it by adding automation, reverb and modulating the EQ to allow for the tonality of this helicopter to change alongside the footage. The final video shows two cars moving through a long tunnel towards and from the camera. This scene was created using both the Audi R8 and Porsche presets, allowing the viewer to differentiate between the two vehicles. To design the car sound effects for this scene, RPM parameters were automated, adding doppler and reverb to create the movement for the cars in this space using the Macro system. Ready to give Igniter a try? Download our free 10 day demo to test it out. 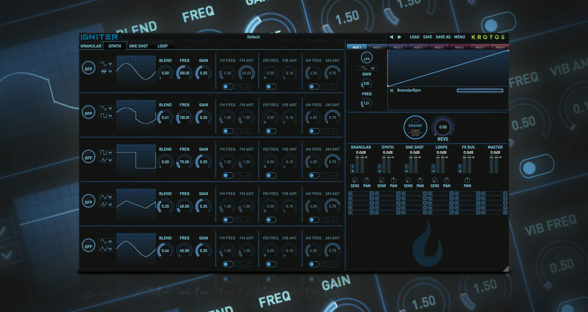 Igniter is available in two versions, and comes included in the Sound Design Bundle 2.